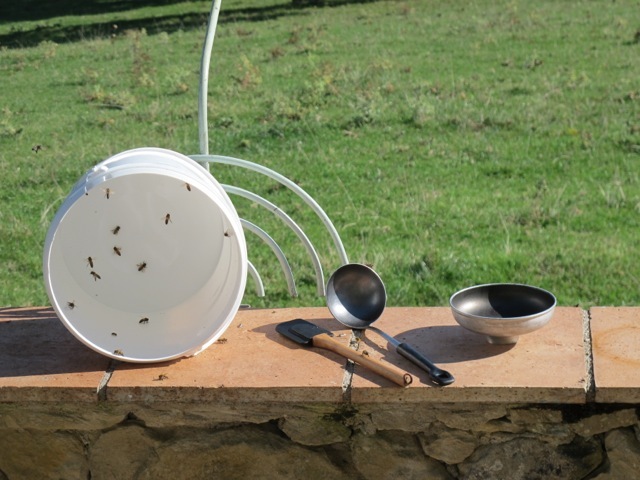 Yesterday (September 1st and officially the first day of autumn for the Met office) our neighbour Alice–beekeeping teacher–arrived with a basket of summertime goodies. 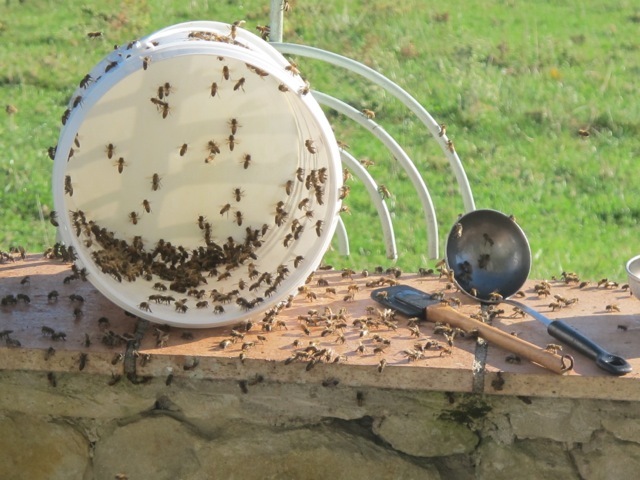 She and Meredith had been collecting honey from her many hives and our ONE in the garden. 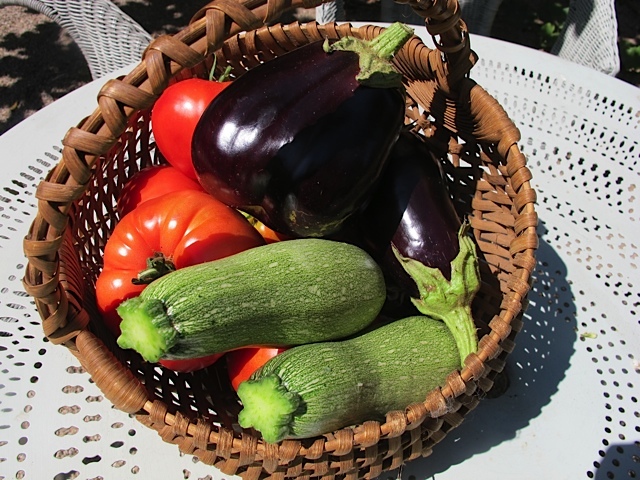 and the basket a reminder of what might have been–peches de vignes, tomatoes and delightful looking little red chilis, the last–“tres forts–attention!” warned Alice. 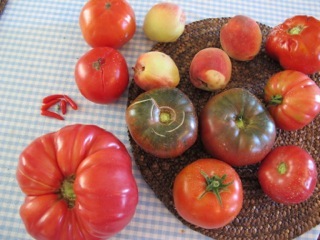 This year our tomatoes were “carried off“–as they used to say about people who caught the plague–by mildew. According to Alice, this has happened to many gardeners–but not to her tomatoes because she saw the signs and acted to stop the rot. The unusually wet weather with little drying sunshine is the cause. Result–in our case–a quick demise of the entire crop; we were away when the plague struck. 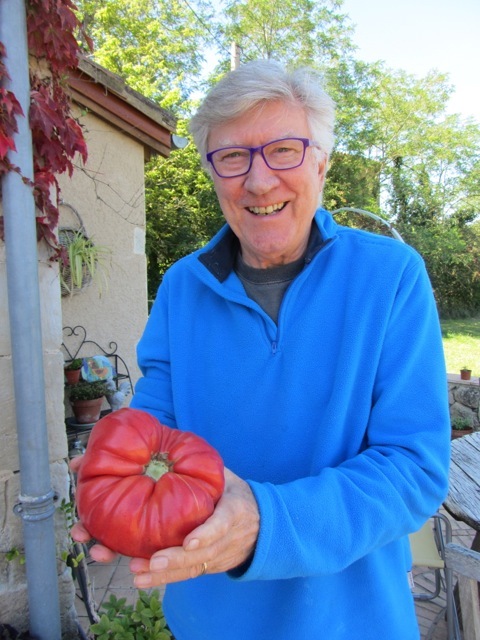 Alice advised keeping a few seeds from the largest tomato, for planting next year which we’ve done, but not before a bit of coarse “look at the size of it!” acting. It’s now in the fridge–a tasty sauce waiting its turn in the limelight, which maybe tonight as part of the stuffing for one of its cousins. 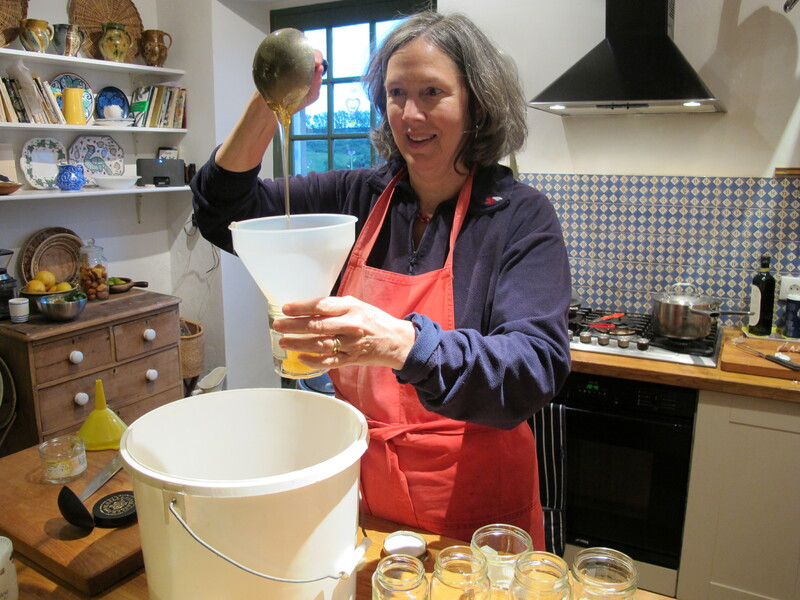 Meredith finished the final honey bottling of the year yesterday. Her bees have performed miracles. 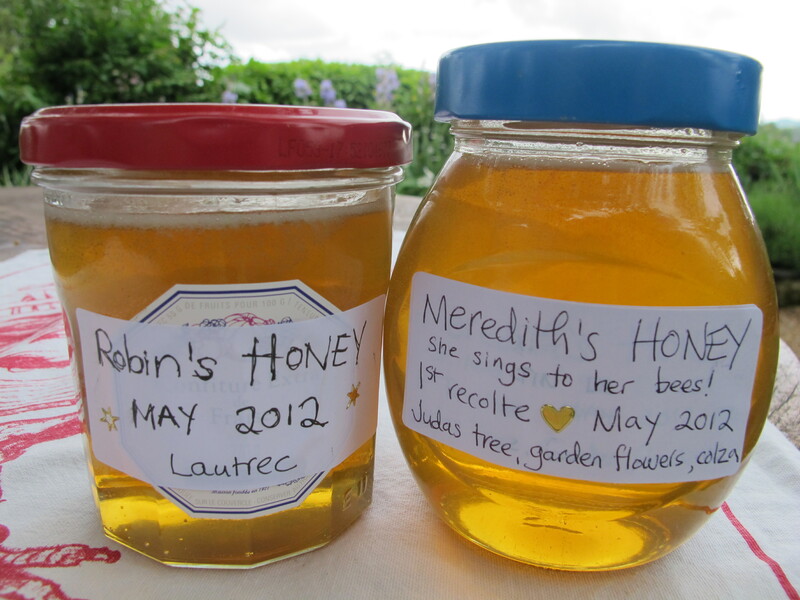 Alice, our generous neighbour’s harvests haven’t yielded anything like the amount Meredith’s single hive has produced. We’re convinced it’s because Meredith serenades them with earth songs from Findhorn and hits from Broadway musicals at the end of the garden. Alice doesn’t buy it. Whatever it takes we say–those workaholic bees need a bit of light relief. 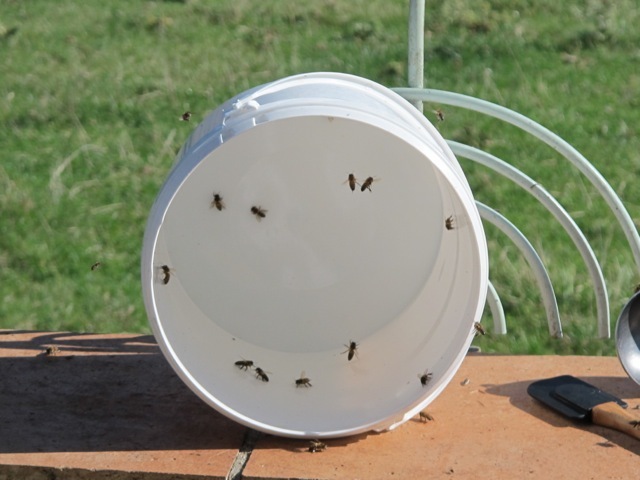 The large white tub that had held the modest yield was empty but very sticky. I put it outside on the wall, opposite the back door, this warm and sunny morning. I wasn’t prepared for what I saw the next time I looked. And how, you might say! 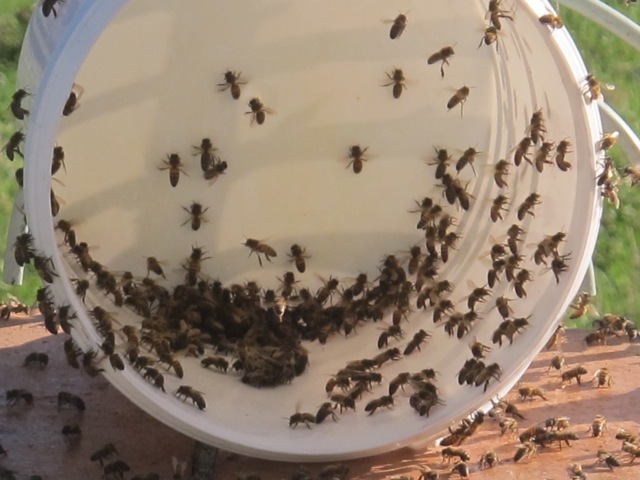 Remarkable–the work ethic of bees! and then?–into the fields and back to work, I guess! 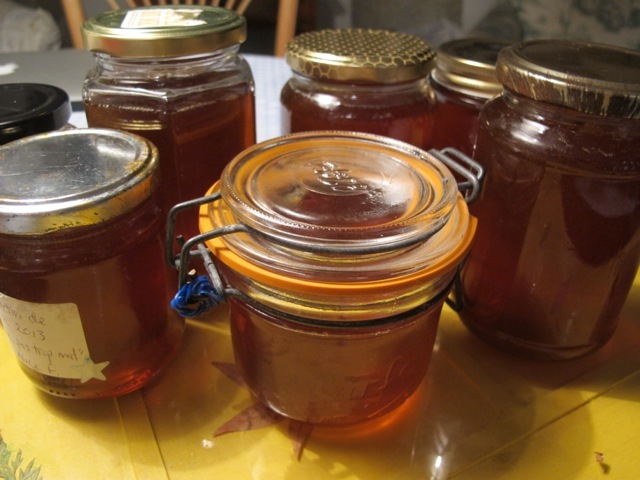 Beekeeping in the South Tarn (part 3)–Honey potted! …from mere DELIGHT to see this GOLDEN TREASURE potted–(not Shakespeare)! obviously meant for each other! 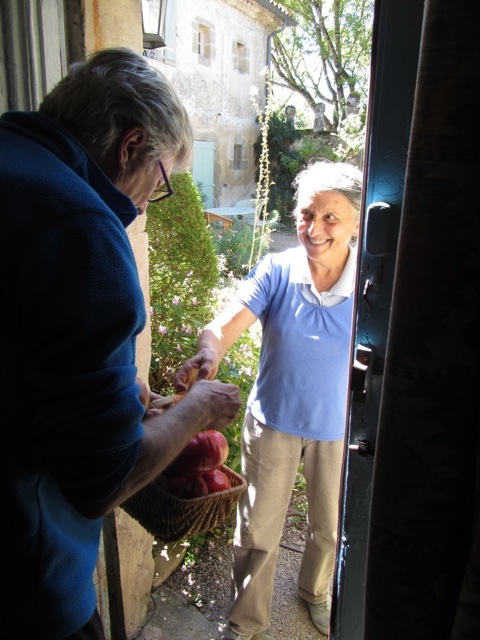 Meredith set off yesterday evening to make the rounds of our neighbors with a basket of pots. She calls it Honey Diplomacy or HD (HD is in our minds as we’ve just bought our first high definition TV after 12 years). 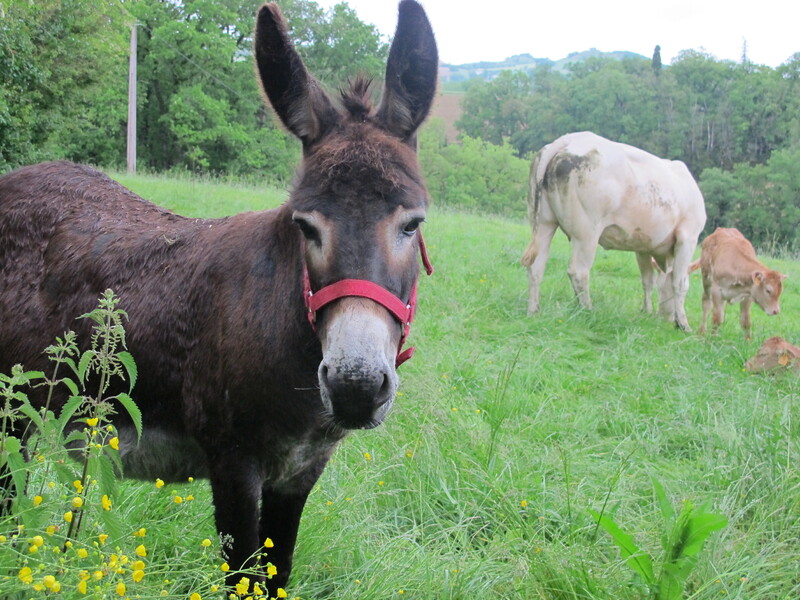 She returned an hour later light on honey but weighed down with compliments and the promise of the loan of Sybil, our young farming neighbors’ pretty donkey, for an event here Saturday afternoon. Sybil pricked up her ears on hearing about the party this Saturday! I’m sitting searching for a new recipe for the chicken we’ll eat tonight when I hear a car draw up. Life in the country is never predictable–especially when you hope it might be for a few quiet minutes! The bell outside the courtyard gently rings and footsteps slowly crunch across the gravel. I put down the cookbook and reluctantly rise to greet the visitor. There is the lightest knock on the front door. 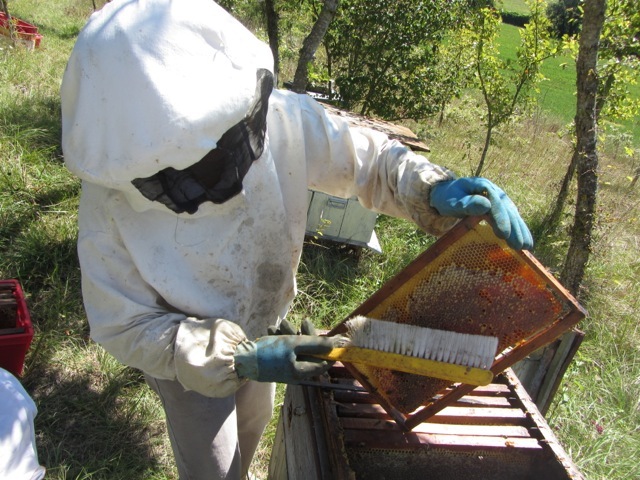 There stands our neighbour Alice, holding a small rectangular box with 2 kilos of her honey in it. She says it’s only fair she shares some with her “second pair of hands”. 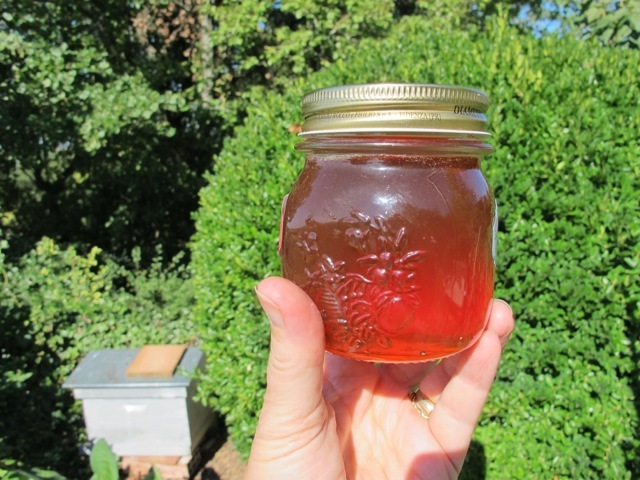 Meredith helped with the recolte [harvest] of her honey on Monday. 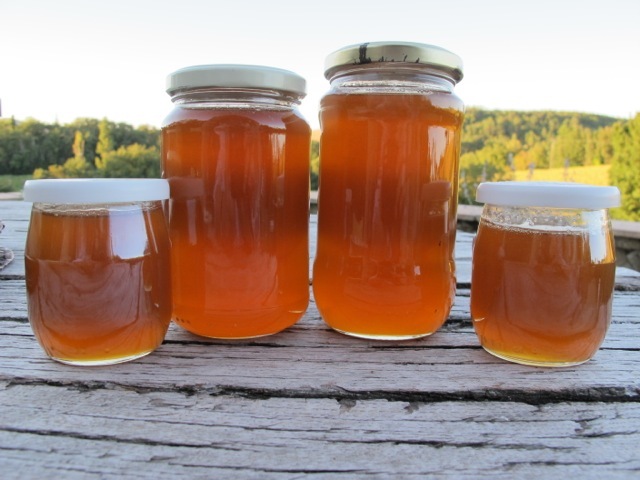 A spoonful of the honey with a tablespoon of the organic cider vinegar from Thursday’s market will help shore up our health as the seasons change. 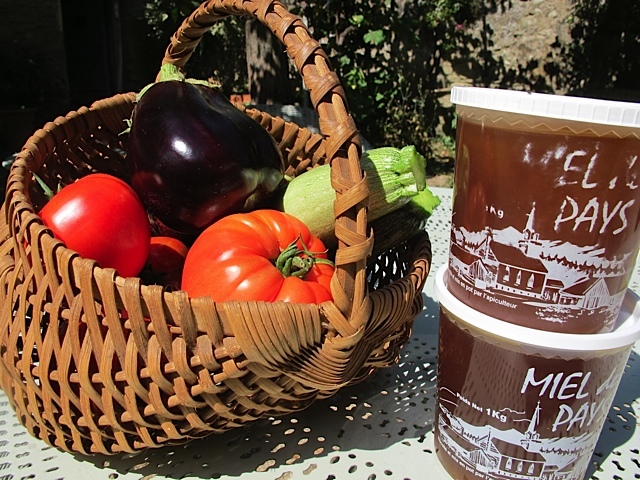 Of more interest to me is the small basket of tomatoes, aubergines and courgettes that Alice holds in her other hand–could make a wonderful ratatouille. “These are probably the last”, Alice says, “in spite of constant watering things have dried up–so enjoy these while you can”. Too right, Alice–superb! Merci beaucoup! Talk of the season change persuades me to try the chicken cooked with dried porcini mushrooms (bought last November in Tuscany) tonight. 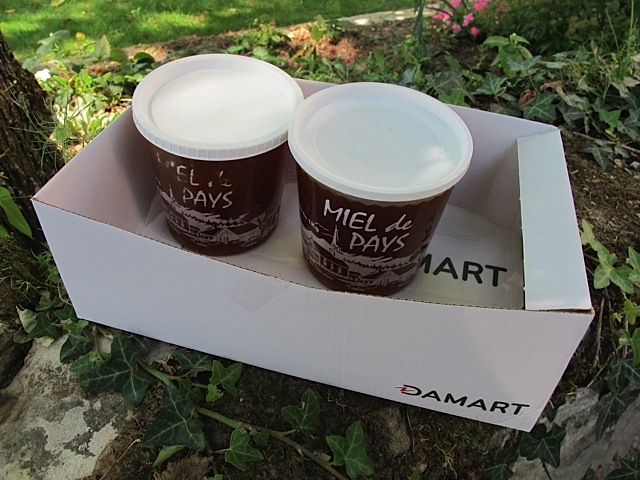 Recipe to follow–if we like it!